Nine Pin Ciderworks 'Cranberry' Cider 22oz. Nine Pin Ciderworks 'Blueberry Peach' Cider25oz. Nine Pin Ciderworks 'Ginger' Hard Cider 22oz. "A spicy yet balanced cider created from a blend of dessert apples from Samascott Orchards and infused with ginger and orange peel." Nine Pin Ciderworks 'Signature' Hard Cider 22oz. 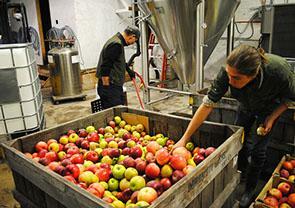 "Nine Pin is a New York craft cider company based in Downtown Albany. Sourced entirely from Capital Region and Hudson Valley apples." Nine Pin Ciderworks 'Blueberry' Hard Cider25oz. NinePin Vanilla Chai cider combines the smooth flavors of vanilla and molasses with familiar notes of warming chai spices. Nine Pin Ciderworks 'Raspberry' Hard Cider 25oz. Nine Pin Ciderworks 'The Idared' Hard Cider 22oz. Nine Pin Ciderworks 'Belgian' Hard Cider 22oz. Nine Pin Ciderworks 'Hunny Pear' Hard Cider 25oz.